Occurs mostly in Bartlett, Bosc, and Comice. Increased incidence in fruit harvested beyond optimum maturity. Promoted by delays in cooling after harvest, warmer storage temperatures than recommended and extended storage. High fruit calcium content correlated with reduced susceptibility. 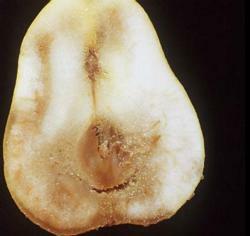 A senescent disorder resulting from storing fruit beyond its postharvest life. A brown, soft breakdown of the core and surrounding tissues. May develop in storage or soon after transfer to warm temperatures. In Bosc, symptoms may be preceded by vascular browning as the fruit ripens. In Bartlett, the watery, brown tissue separates easily from the healthy tissue. A part of the normal sequence of ripening and senescence where fruit become ripe, then overripe and then core breakdown occurs. 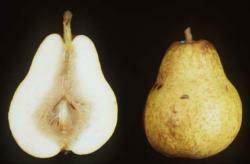 In freshly harvested pears, the time between the ripe stage and the occurrence of breakdown is approximately one week. The longer fruit are in storage, the shorter this time becomes. In fruit which are overstored these changes occur so quickly that at no time is the pear fit to eat, and the breakdown may occur before the fruit becomes ripe. Yellowing in storage is a good indication of susceptilibity to core breakdown. Higher concentrations of CO2 in the core area prior to core breakdown incidence has been reported and acetaldehyde may accumulate in overstored fruit and may contribute to core breakdown. Avoid storing pears beyond their postharvest life. To extend postharvest life, fruit should be rapidly cooled and stored at the lowest non-freezing temperature (generally -2 to -1°C, 28 to 30°F). Controlled atmosphere storage can extend the postharvest life as much as two-fold. Monitor fruit color as it approaches its typical storage life. Market any fruit that begins to yellow. Blanpied, D. G. 1975. Core breakdown of New York ‘Bartlett' pears. J. Amer. Soc. Hort. Sci. 100:198-200. Market Diseases of Apples, Pears, and Quinces. 1971. Agriculture Handbook No. 376. Agricultural Reseach Service. USDA. Postharvest Disorders of Apples and Pears, Meheriuk, M., Prange, R. K. Lidster, P. D., and Porritt, S. W. (eds.). Communications Branch, Agriculture Canada, Ottawa, Ont K1A 0C7.